13. Alfred Edward Mathews (1831-1874). 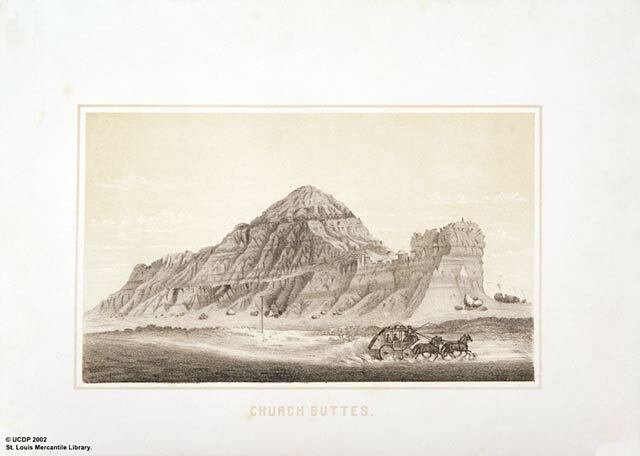 Church Buttes. Tinted lithograph, Plate 17. Mathews, A.E. Gems of Rocky Mountain Scenery. New York: The Author, 1869. St. Louis Mercantile Library at the University of Missouri - St. Louis. "This truly singular formation is near the old overland stage road, within eight miles of the Union Pacific Railway, and forty-five miles from Green River, in the Territory of Utah. The sketch was made when Wells, Fargo & Co.'s coaches were running, and represents one of them going west."